The novelist Eudora Welty said, “Writers and travelers are mesmerized alike by knowing of their destinations.” That could easily be the epigraph for Jean Grant’s finely crafted new novel The Burning Veil. 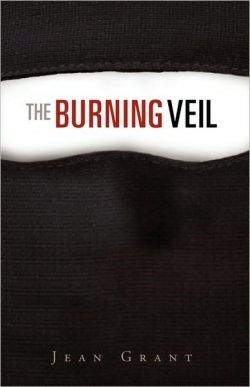 The story of an American woman’s introduction to Saudi Arabian culture, The Burning Veil avoids clichés of the Middle East, and finds a compassionate thread in even the most conservative of its characters—from Muslim extremists to American racists. Grant, a former journalist who lived in the Middle East for 20 years, takes on touchy subjects with a deft, professional touch, and is careful not to foist her political agenda on the reader. Her novel connects two vastly different societies, showing that love and mutual respect is the best way to coexist. Dr. Sarah Moss, redheaded, outgoing, and American as apple pie, meets Ibrahim Suleiman while he’s on a student visa in her hometown in Wisconsin. Sarah is drawn to Ibrahim’s otherness, but also feels completely comfortable with him. “She thought of Ib’s nuanced way of thinking and his endearing quirks: the way he would place his palm on his chest, bow his head and close his eyes when he said thank you; the way he never looked at his watch or seemed to be in a hurry; the way he sent her glorious bouquets all the way from Hawaii.” Sarah eagerly accepts a short-term position in Ibrahim’s family’s clinic in Saudi Arabia, hoping to test the waters of their relationship. Can she really marry someone from such a different culture? Could she ever fit into Muslim culture, where women are veiled and secluded? Grant lets the images in The Burning Veil do most of the work, and the novel is a delight to read. Sarah’s adventures in Khobar are personal, emotional—but also speak to larger themes of love, forgiveness, compatibility, and justice.